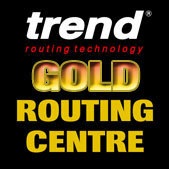 Trend T11EK 240V 2000w Vari- Speed Router + 35pc Cutter Set Worth £79 & 1/4inch Collet Free! Power Tools > Routers & Accessories > Routers-1/2"
SUPPLIED WITH TREND 1/4" COLLET FREE WORTH £31.50! Trend T11EK With built in Quick Raiser™ fine height adjuster. Router fine height adjuster for above and below height adjustment. One revolution of handle equals 1.5mm. Three quick release recesses in base to fit tables in conjunction with optional Quick Release Kit. Extra large base aperture for large cutters. The T11's revolutionary base design has a large 75mm diameter aperture, ideal for large cutters when mounted in a router table, with no need for a false table surface. The adjustable Inner Plate ensures concentricity with the cutter and allows all standard Trend guide bushes to be fitted. *115v router will require a 32A BS4343 115v plug. Minimum generator or transformer requirement 3000 kVa continuous with a 32A BS4343 115v socket outlet. 115v units cannot be used with CRT/L and PRT/L no-volt release switches.